Tomorrow is going to be a whirlwind of shopping. A barn sale that will be amazing, if it’s anything like the last one I attended there, and at least 3 church rummage sales. Plus whatever other yard sales I can squeeze in before my wallet is empty or the van is full. So not a lot of words tonight. Just straight to photos of my vintage Disney toys. I think this is the dog from Lady and The Tramp. Tramp, is that you? I’m thinking they would probably pick another name for the dog if that movie was made today. 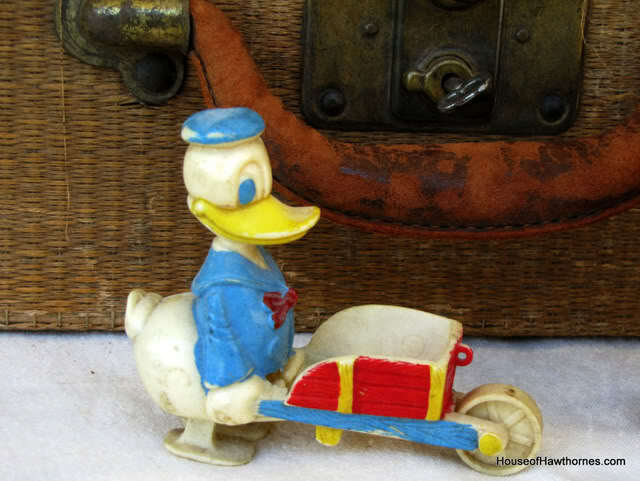 Donald Duck is a ramp walker. If you put him on an incline, the gravity makes him walk forward. For these photos I boosted contrast slightly, added the You’d Be Surprised texture from Shadowhouse Creations, blending mode of Soft Light at 80% Opacity. Tonight I’m partying with Photo Feature Friday at A Rosy Note, Vintage Inspiration Friday at Common Ground and Show & Tell Friday at My Romantic Home. Grab a Margarita for Cinco De Mayo and join me! OK, I’m going to run off to Mapquest my day of shopping. Do you have any big yard sale plans this weekend? Oh have fun shopping and please show and tell what u get! I have my mothers mickey mouse wash machine from the 1930’s and some of the 7 dwarf figures she had. oh and a donald duck too! Barn sale… I’m so jealous! Can’t wait to see what you find. Maybe, you should rent a trailer 🙂 I’m thinking this won’t be a good weekend for sales, here, due to Mother’s Day. You’ll have to shop for me too. 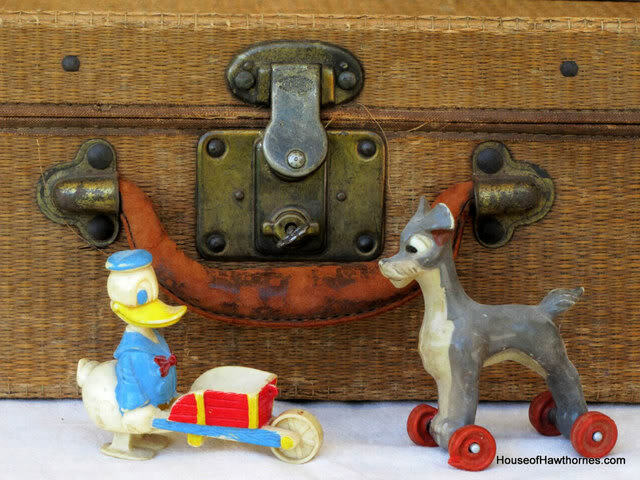 Darling vintage toys! These turned out so cute Pam. I love the toys and the shots looks great with that texture. I tried using it the other day but I was not having luck with it looking so good! Mine came out so much darker even with soft light. What a lovely Disney toy collection. Have a wonderful day of shopping. Can’t wait to see your latest finds. These are great Pam. Have fun shopping. I can’t wait to see what you purchase!! I can’t wait to see what you bought! Love these Disney toys. How fun! I am looking forward to seeing all your great finds from this weekend of shopping! We have THREE yes THREE neighborhoods that are having sales this weekend! OH MY!!! 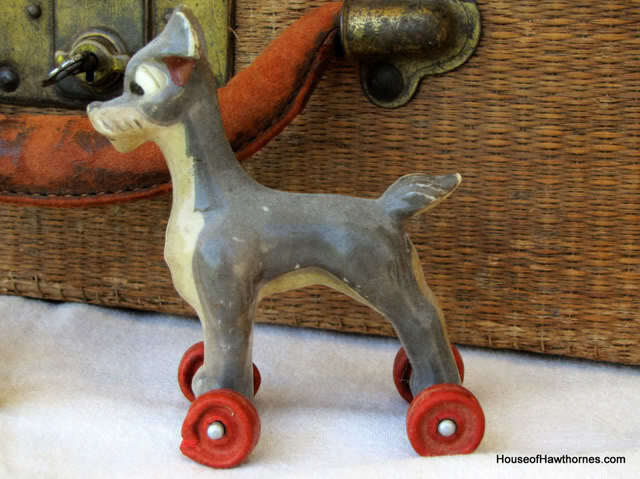 I loved Tramp in the movie, and your little vintage Disney toys are wonderful. We had Disneyland passes for several years and would like to get them again. Love your toys and I do love Tramp!! !